• Elastic Loops hold a total of 17 Shot Shells. • There are 2 rows of 6 Elastic loops inside the Pouch and a single row of 5 Elastic Loops of the front Flap of the Pouch. • MOLLE Compatible. 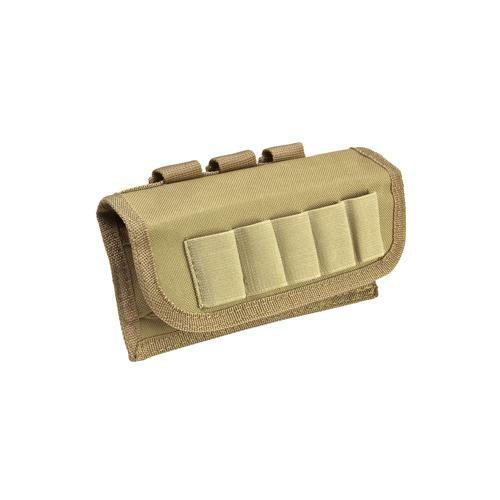 Vest, Shotgun Case, Shotgun Scabbard, or any MOLLE compatible gear. • Has three PALS Straps located on the back panel for securing Pouch onto MOLLE webbing. • The Flap is secured to the front of the pouch with Heavy Duty Velcro. • The Flap can also be secured onto itself, using the extra strip of Loop Velcro sewn onto the inside of the Flap. • This will give the shooter an open and easy access to the Shot Shells inside the Pouch. • There are also two each 2¼ Belt Loops on the backside of the Pouch, for securing it onto a Belt. • All edge seams are double stitched and re-enforced with web material. • There is a drainage Grommet located in the bottom of the pouch.